WELLINGTON, New Zealand (AP) — New Zealand became the first nation in the world to allow women to vote 125 years ago, and hundreds of people celebrated the anniversary on Wednesday by turning out to gatherings and speeches. Some wore period costumes or white camellia flowers, a symbol of the historic movement. New Zealand’s female lawmakers also marked the occasion by re-enacting an all-male photograph of lawmakers taken more than a century ago. This time, the photograph featured New Zealand’s third female Prime Minister Jacinda Ardern in the center, holding her 3-month-old baby Neve. Ardern was also the guest editor for the “suffrage edition” of the country’s largest daily newspaper, The New Zealand Herald, although some questioned whether that move could taint the political neutrality the paper seeks in its journalism. Liberal lawmakers introduced a new bill Wednesday that they say is aimed at addressing historic lower pay for women by making it easier for workers to make claims for pay equity. 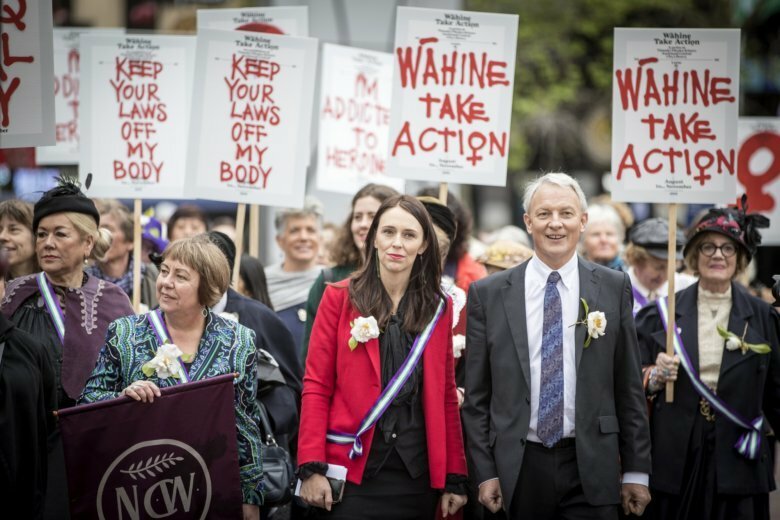 Earlier in the day, Ardern spoke to hundreds of people gathered in Auckland, telling them her own great-great-grandmother had signed the petition for women to get the vote back in 1893. In her edition of the newspaper, Ardern wrote that she felt an “enormous sense of responsibility” to capture women’s voices and highlight the extraordinary within the ordinary. She pointed out that she left the content and placement of political stories to the news editor. The paper featured a photograph of Ardern, who is liberal, with New Zealand’s two previous female prime ministers, Jenny Shipley and Helen Clark. The focus on a diverse group of women throughout the paper was applauded by many readers. But conservative commentator David Farrar compared the treatment of Ardern by the newspaper, which also featured her in a large billboard, to North Korea’s reverence for its leader Kim Jong Un. The news organization Stuff pointed out that while New Zealand had made global history by giving women the vote, one of its own newspapers had been on the wrong side of that history by saying in an editorial at the time that the “shrieking sisterhood” had forced the vote on women. Other parts of The Press editorial have better withstood the march of history.